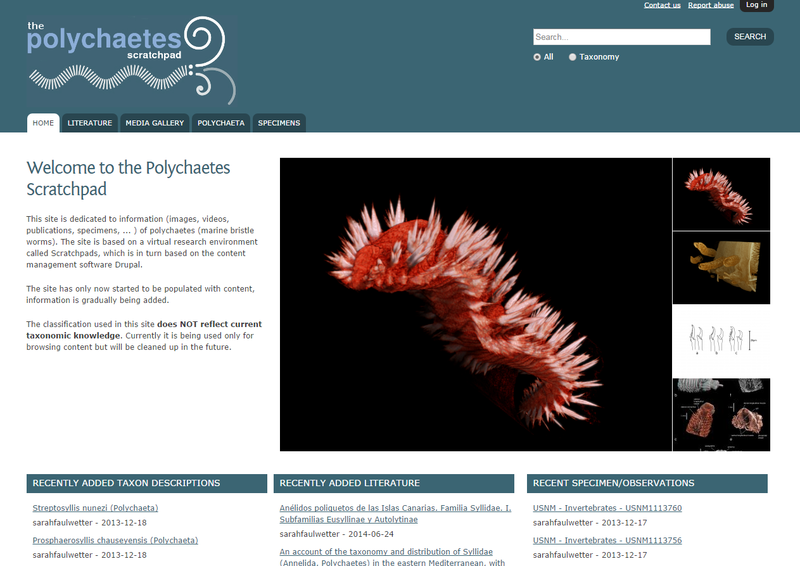 The Polychaetes Scratchpad site is dedicated to information (images, videos, publications, specimens, etc.) of marine bristle worms (Polychaeta). The site has started to be populated with content very recently and information is gradually being added. The classification used in this site does NOT reflect current taxonomic knowledge. It is currently being used for browsing content only, but will be cleaned up in the future. The database is maintained by the Institute of Marine Biology, Biotechnology and Aquaculture of the Hellenic Centre for Marine Research (HCMR). It is supported by the Greek LifeWatch infrastructure. Scratchpads was developed by the Virtual Biodiversity Research and Access Network for Taxonomy (ViBRANT), a EU FP7 project. The site is based on a virtual research environment called Scratchpads, which in turn is based on the content management software Drupal.